6 Fit Foods That Beg To Be Grilled! Meat might be the mainstay of your summer grilling plans, but these 6 delicious sides prove that seafood, cheese, and even fruit are better with a little char! It's that time of year again, when you drag the grill out of hibernation and give your oven the night off. Flame-kissed steak or boring meatloaf? We know which one makes your mouth water! Why hover over the stove when the warmer months are the perfect opportunity to play with fire and take your cooking outdoors? Indeed, grilling can be a great way to load up your diet with plenty of muscle-building favorites like steak, fish, and poultry. But even though meat is a barbecue mainstay, there are plenty of other nontraditional foods that taste even better when flecked with a bit of char. Many such edibles are also loaded with the nutritional firepower needed to help ensure that the only six-pack you have isn't in your cooler! Here are six worthy foods ready to come out from hamburger's shadow that you probably aren't grilling—but definitely should be. So get ready to become the outdoor cooking hero of your neighborhood and keep your summer smoking hot. Flame-licked avocado has a praise-worthy texture—slightly crispy on the outside and almost molten on the inside. Plus, it's a ticker-friendly addition to your summer grilling line-up. Flame-licked avocado has a praise-worthy texture—slightly crispy on the outside and almost molten on the inside. A 2015 study published in the "Journal of the American Heart Association" found that overweight volunteers on a moderately high-fat diet (34 percent of overall calories from fat) that included a daily avocado experienced a larger drop in LDL—sometimes referred to as "bad" cholesterol—than when they ate a lower-fat diet (24 percent of overall calories from fat) or a diet that included the same number of fat calories but without a daily avocado.1 Scientists surmise that a combination of unsaturated fats, fiber, and compounds like plant sterols are behind the cholesterol-busting powers of this mighty fruit. 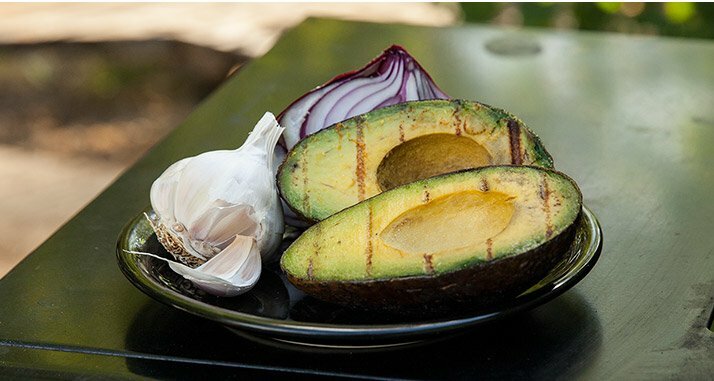 Grill it: Brush cut sides of an avocado with oil and season with salt and pepper. Place on the grill grate cut-side down and cook until golden brown and slightly charred, 3-5 minutes. To make the best guac ever, scoop out the grilled avocado flesh and mash with lime juice, then stir in diced mango, diced red onion, chopped cilantro, a minced garlic clove, and salt and pepper to taste. Beyond tortilla chips, use as a killer burger topping. Cheese? On the grill? You bet. Halloumi is a marvelous cheese from Cyprus that doesn't melt on the grill, making it the perfect meat alternative or accompaniment. Over the flames, the outside becomes crispy while the inside turns velvety. In other words, yum! 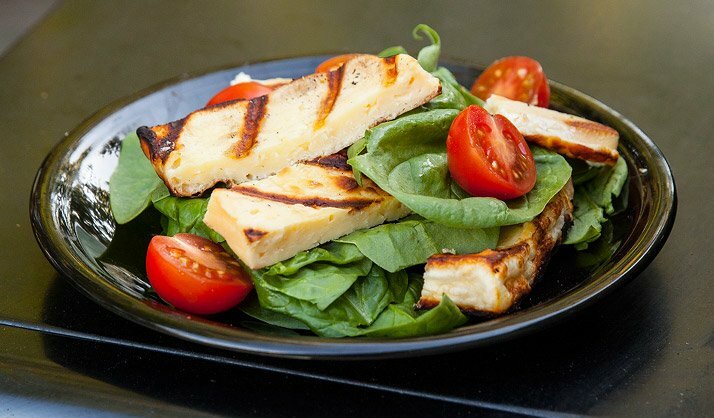 Beyond adding some high-quality dairy protein to your diet, halloumi is also a source of bone-building calcium. The only downside is that the meaty cheese is often fairly high in sodium, so just keep tabs on your intake elsewhere. Halloumi is a marvelous cheese from Cyprus that doesn't melt on the grill, making it the perfect meat alternative or accompaniment. Grill it: Brush thick slices of halloumi with oil and grill over medium-high heat for 1-2 minutes per side, or until nice grill marks appear. Serve over a bed of spinach and sliced cherry tomatoes and top with lemony vinaigrette. Or skewer thick chunks of halloumi along with vegetables like red bell pepper, eggplant, and red onion for a tasty kebab riff. If you're in the "meh" camp when it comes to kale, you've got to try it grilled. The grilled leaves are blessed with a crunchy, smoky char in some spots, while chewy and tender in others. The stalks—which don't have to be removed, thereby saving you prep time—become deliciously crunchy. If you're in the "meh" camp when it comes to kale, you've got to try it grilled. The grilled leaves are blessed with a crunchy, smoky char in some spots, while chewy and tender in others. 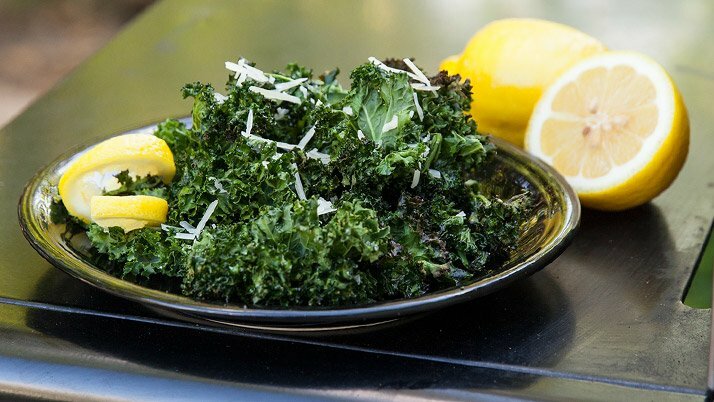 The best type of kale for the grill is Tuscan kale (as opposed to curly kale), also known as lacinato or dinosaur kale, since the leaves can lie flat on the grill. Grill it: Brush Tuscan kale leaves with oil and season with salt and pepper. Lay the leaves side by side in a single layer on top of the grill grate and heat until crispy, about two minutes. Turn over and grill on the other side until darkened in spots, 1-2 minutes. Serve drizzled with fresh lemon juice and even some grated Parmesan cheese. On top of supplying plenty of protein to help you build up beach-ready muscle, the shellfish are a stealthy source of omega-3 fats. Grill it: Place a bunch of mussels directly on the grate with the more rounded side down. Heat for 3-5 minutes, or until the shells open. Discard any that remain shut. 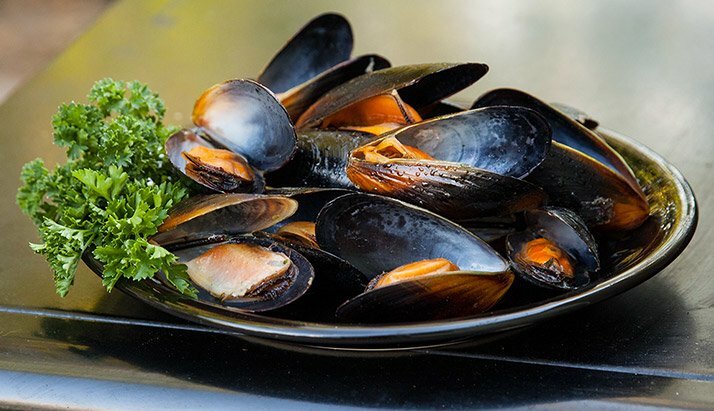 Place the cooked mussels in a bowl and top with chopped parsley. Exposed to the intense heat of the grill, naturally occurring sugars in peaches and other fruits like pineapple, watermelon, and mango become caramelized, which only serves to intensify their sweetness. Sun-kissed peaches supply fat-fighting fiber as well as vitamin C.
According to researchers in Greece, low intakes of vitamin C could be associated with poor exercise performance.4 It's thought that vitamin C acts as an antioxidant to help lessen the oxidative stress associated with working out. Exposed to the intense heat of the grill, naturally occurring sugars in peaches and other fruits like pineapple, watermelon, and mango become caramelized, which only serves to intensify their sweetness. Grill it: Brush the cut sides of pitted peach halves with oil and place on the grill, cut-side down. Heat over medium until the fruit softens and grill marks appear. 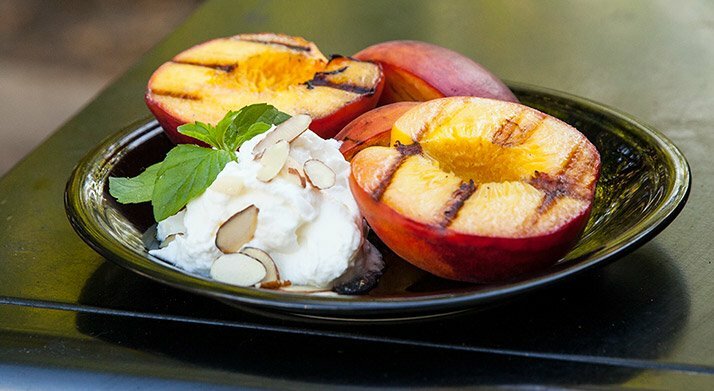 Make a physique-friendly dessert by topping grilled peach halves with dollops of plain Greek yogurt, chopped nuts, and sliced fresh mint. When the temperature outside begins to soar, there's no need to crank up the oven in order to give your spuds a great roasted flavor. 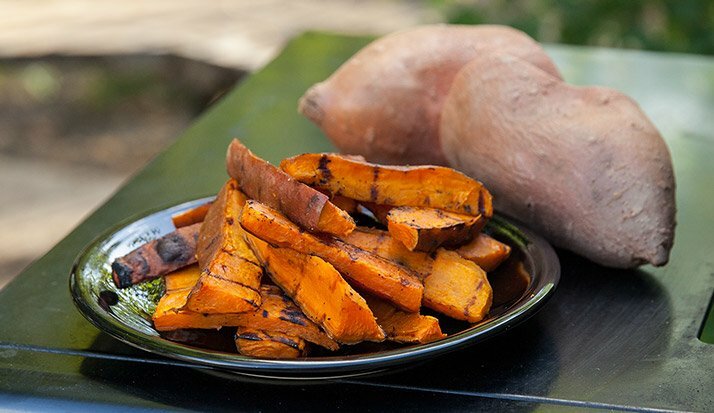 For a healthier version of a burger's best friend, try roasting sweet potato slices on the grill to give you the complex carbohydrates your muscles need to keep up the pace all summer long. Even better, sweet potatoes are loaded with the antioxidant beta-carotene. Harvard scientists discovered that greater carotenoid concentrations was associated with enhanced optimism in both men and women.5 So a plate of grilled sweet-potato fries may help you see the sunny side of things all summer long. For a healthier version of a burger's best friend, try roasting sweet potato slices on the grill to give you the complex carbohydrates your muscles need to keep up the pace all summer long. To allow the inside of the potato to finish cooking before the outside becomes overcharred, it's best to parboil sweet potato in a pot of water just until slightly tender. Grill it: Slice sweet potato into wedges. Place the wedges in a pot, cover with water, and bring to a boil. Simmer just until slightly resistant when pierced with a knife, about five minutes. Drain well and toss the wedges with oil and desired seasonings. Try a mixture of smoked paprika, garlic powder, salt, and black pepper. Place the wedges on a grill grate over medium heat and grill until dark marks appear and potatoes are cooked through, about 15 minutes, flipping once halfway through. Wang, L., Bordi, P. L., Fleming, J. A., Hill, A. M., & Kris?Etherton, P. M. (2015). Effect of a moderate fat diet with and without avocados on lipoprotein particle number, size and subclasses in overweight and obese adults: a randomized, controlled trial. Journal of the American Heart Association, 4(1), e001355. Juanola-Falgarona, M., Salas-Salvadó, J., Martínez-González, M. Á., Corella, D., Estruch, R., Ros, E., ... & Bulló, M. (2014). Dietary intake of vitamin K is inversely associated with mortality risk. The Journal of Nutrition, 144(5), 743-750. Zebrowska, A., Mizia-Stec, K., Mizia, M., G?sior, Z., & Poprz?cki, S. (2015). Omega-3 fatty acids supplementation improves endothelial function and maximal oxygen uptake in endurance-trained athletes. European Journal of Sport Science, 15(4), 305-314. Paschalis, V., Theodorou, A. A., Kyparos, A., Dipla, K., Zafeiridis, A., Panayiotou, G., ... & Nikolaidis, M. G. (2014). Low vitamin C values are linked with decreased physical performance and increased oxidative stress: reversal by vitamin C supplementation. European Journal of Nutrition, 1-9. Boehm, J. K., Williams, D. R., Rimm, E. B., Ryff, C., & Kubzansky, L. D. (2013). The Association between Optimism and Serum Antioxidants in the Midlife in the United States Study. Psychosomatic Medicine, 75(1), 2.